Psychologists are running a nation-wide high demand in Canada. Psychology is a versatile subject where psychologists study behavioral problems as well as cognitive disorders. They counsel clients as well as engage in research. British Columbia: Areas like Lower Mainland and Vancouver seem very promising. Professionals specializing in Neuropsychology and Forensic psychology are greatly desired by employers. Those who wish to privately practice can also do really well. Saskatchewan: The prospects in this province are good. Ontario: The prospects in this province are very tempting. The ones having doctoral degree in Health and Social Psychology can do really well here. There are great opportunities for research activities here. Nova Scotia: Areas like Halifax and Cape Breton are hubs for Psychologists in this province. Prince Edward Island: There is a critical shortage of Psychologists in this province. More than half of the vacancies for Psychologists are waiting to be filled. Doctorate in Psychology is required to be designated as a “Psychologist” in Ontario, British Columbia, Manitoba. You can earn up to CDN$51 on an hourly basis as a Psychologist in Canada. So what are you waiting for? Fill up our free online assessment form now! 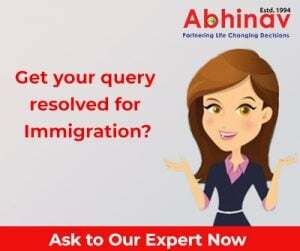 At Abhinav, our ever increasing clientele is not only the evidence of our name in the business but the direct proportionality of the hard work that we put in each client. We look forward to having you soon!! 25 Per Cent Cut in Non-EU Entries recommended! Asylum Seekers in Aussie Sew Lips! psychologists…. are less credited for their work in India…. majority of indians do not consult a pyschologists and somebody advises them to visit a psychologists…. they say i am not mentally ill.
Well in Canada… they are well treated and respected..
requirement like Good communication skills, patience, ability to work with all kinds of social/ cultural and age groups are the essential qualities of a psychologist. I am a psychologist (Industrial/Counseling) looking for good opportunity in Canada. I would be highly obliged if you guide me through the process..
As on date Canada Immigration is on hold and likely to get open for the applicants in January 2013. Kindly write us at sanam@abhinav.com with your detailed resume. I have done masters in clinical psychology and have been working in a school since last two yrz as a psychologist I want to work in canada as there is no respect for our here.therefore please guide me how I can apply etc. I am having a masters in clinical psychology and I really look forward working in canada can you please inform me the opportunities and other formalities.